When Venezuela's late President Hugo Chavez thought of building the country's first socialist city, he could have not imagined a better inhabitant than Margarita Fornica. A mother of five and a community leader, Ms Fornica is the embodiment of the perfect socialist. Despite an economic crisis and anti-government protests that have rocked Venezuela this year, her faith in President Chavez's Bolivarian revolution remains unshaken. And so do her desire to contribute to it and create change, too. "When we lived in the slums, we used to lock ourselves up in our homes and we didn't care about what happened around us," she says. "Chavez changed our lives completely." Ms Fornica used to rent a house in a slum on the hills that surround the capital, Caracas. Her family barely managed to get by. Thanks to the severance package from a previous job, she managed to buy all the appliances for her kitchen. A few months later, in November 2010, rains caused a landslide, hitting the home next to hers, which collapsed into Ms Fornica's kitchen, destroying everything. Her family was fortunate to escape alive. For nine months, they lived in a series of shelters. "It was very tough, it really affected us. I was worried about my children growing up in such an unstable environment." But her family was lucky. One day she received a call from the government and was told that she had been assigned a flat in Ciudad Caribia. "Initially, I had no idea what it [Ciudad Caribia] was," Ms Fornica says. "Imagine our surprise when we found out we were going to live here!" Without having to spend a penny, Ms Fornica was handed the keys to a flat with three bedrooms, two bathrooms, a living room, a kitchen with all the appliances and a small balcony. Her bedroom window looks out to the sea: the views are stunning. Ciudad Caribia - which takes its name from Venezuela's indigenous Carib people - is situated on the mountains that divide Caracas from the Caribbean. Its location was entirely down to chance. President Chavez was once travelling by helicopter and landed on these mountains because of a technical malfunction. He said it was then that he imagined the possibility of building a utopian socialist city there, from scratch, despite the difficulties of bringing basic services such as water, gas and electricity to this remote area. 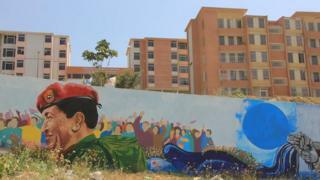 Many now call it the apple of President Chavez's eye: everywhere you go, his face looks down on the city from murals and posters. Critics complain that construction has been too slow and demand more transparency surrounding the large sums invested by the government. Housing remains a huge issue in the country. Fifteen years of government programmes and millions of dollars of investments have not been able to fix a shortfall of as many as three million units, according to critics. They also say that Mr Chavez and his successor, Nicolas Maduro, used the free homes to buy the support of Ms Fornica and thousands like her. But Ms Fornica believes the late president just gave her family - and many others - the opportunity for a fresh start. Over the years, the flats of Ciudad Caribia have been handed over to those made homeless by the floods. So far, 10,000 people live in the city. As many as 100,000 are expected to eventually be able to settle here. President Chavez's idea was not to build yet another satellite city. The plan was to make Ciudad Caribia independent: a new city where people could live, study and work. The city has kindergartens and schools, an adult education programme, football and basketball pitches, a government-run health centre, a government-subsidised bakery and supermarket, and even an industrial area, which is yet to be developed fully. This is in stark difference to the majority of slums in the hills that surround Caracas, where people live in precarious shacks and have long commutes to work. "I don't lose my hope that one day we'll see the majority, if not the entirety, of the hills of Caracas like Ciudad Caribia," Mr Chavez said in December 2011, during an official handing over of flats. Ms Fornica works as a cleaner at one of the schools, while studying in the evening. Moreover, she is a well-respected community leader. As she walks around the city, many people stop her to ask about government-run activities, while others complain about the noise coming from the neighbours. This is the hardest part, she says: making sure the community learns to take care of itself and develops new habits. For example, one of her worries is that Venezuela's high murder rate and violence do not hit Ciudad Caribia too. So far, very few murders have taken place. But Ms Fornica wants to develop a community-based security system so that every neighbour starts feeling responsible for the well-being of the entire community. "What is a socialist city? For us, it means that we all live in equality and fairness. That we all have a right to education, to health, and to live well," she says. Ms Fornica believes that the community owes it to President Chavez to stand up for Ciudad Caribia: "His legacy was that we have the solution to our problems in our own hands." You can hear Irene Caselli's interview with Margarita Fornica on Outlook on Wednesday 18 June at 11:00GMT. Video Socialist paradise or ghetto?